We at the infrastructure working group make sure that all that we need for the Climate Camp and the Degrowth summer school ends up here on the meadow. We receive support from many great groups to make this happen. For example, Campstuff is providing us with electrical gear. Equipment for interpreting and music comes from Rebelsound of Berlin. The tents are provided by various Scout and Falcon (Social Democratic Party’s youth group) local chapters, and many of them by the Elbe Workshops of Hamburg. And here locally we are being supported with food, straw, and firewood. We are a charmingly disorganized bunch of people who have been providing power supplies in camps for a decade now. We are not simply service providers, but activists looking for the revolution, and want to share and increase our know-how. We are specialized in providing solar power and dealing with power outages. 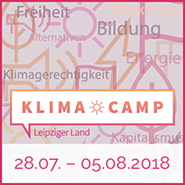 We want not only to shut down lignite-coal-fired power stations and capitalism, but start up the alternatives here and now. This means that we are not trying to support unlimited consumption of electricity in the camp with our limited resources. The camp will be supplied with solar and wind power, as far as possible. If that is not enough, we may switch on the generator from time to time, and if the site is connected to the public grid, we will use that electricity, too. We are trying not to use any fossil fuels. How well the different sources function incl. solar and wind you can ask in the Power tent. And why it may not be environmentally sound to use electricity from RWE. You will find the sanitary facilities for the entire camp at a central location. Besides the composting toilets, showers, wash-basins, and a drinking-water supply point are located here. Since drinking water is a valuable resource, please do not be wasteful of it. In order not to pollute the environment unnecessarily with cleaning products, please use biologically degradable soaps, toothpastes, shower gels, etc. We try to provide as much as possible here. At the camp, there will be only composting toilets or urine-diverting dry toilets. The purpose of composting toilets is to capture faeces (stools), instead of sending them to a water-based sewage treatment system. In this way, 3 to 6 litres of water can be saved each time you use the toilet. Since in this case, urine-diverting dry toilets are used, which separate dry and wet wastes, the solid components can be composted well, and returned to a natural foodstuffs cycle. In order to ensure that this works, it is important that you follow the instructions on the toilets. 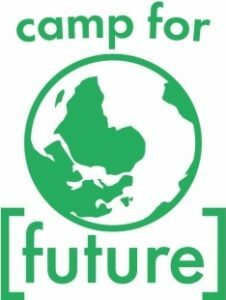 The whole infrastructure has continued to grow and been improved in recent years, along with the Climate Camp, so that it has become flexible and mobile, and was and is used for other camps. If you have suggestions, or want to join in fiddling with the hardware of the camp, you will be most welcome.